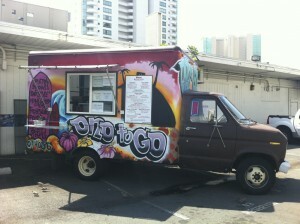 Ono To Go (@OnoToGo), the food truck run by Wedge Lee (@WedgeLee) will be open on Saturday for the first time tomorrow. Though mobile, Ono To Go’s home base is behind 1346 Kapiolani Blvd., near the corner of Makaloa St. & Sheridan St., across from the back end of the Wal-Mart on Keeaumoku St. And Wedge will be there tomorrow, Feb. 19, from 10 a.m. to 1 p.m., to satisfy hungry fans. All of Ono To Go’s regular daily grilled items will be available, but Wedge shared some news during a Hawaii Flickr Meetup today. As part of his first Saturday opening, Wedge said he’ll be unveiling a revamped menu. The most popular Ono To Go plates will be front and center, including the popular sampler combo and his famous pork chops. He’ll still be serving turkey on Tuesdays, but on Thursdays, diners can look forward to a featured chef’s selection. Finally, Ono To Go’s irresistable poke will officially be available as a side, added to any plate for just $2. No doubt many Ono To Go and food truck fans will turn out tomorrow for a rare weekend feast. But Wedge admitted that one of the most frequently asked questions is whether he’ll be at next Friday’s “Eat the Street” food truck rally in Kakaako. Unfortunately, Ono To Go will not be participating. “Next time!” he tweeted, and today explained that he’s simply got too much on his plate next weekend. Ono To Go will be the main lunch attraction at the Unconferenz at Windward Community College next Saturday. And if that weren’t enough, he’ll be jetting off right afterward to a second, large catering gig on base. So if you’ve never been able to make it to Ono To Go during a weekday lunch, tomorrow’s Saturday run is a great time to finally check it out. And if successful, Wedge says we can look forward to other Saturday specials, perhaps as often as once a month!